The University of Plymouth has a strong track record of working in partnership with industry developing lasting relationships with some of the region’s biggest employers, as well as a number of innovative SMEs. Langage Farm is one business to have benefited from its special relationship with the University of Plymouth. Nestled in the Devon countryside, Langage Farm has been a farmstead for more than 900 years. Looking firmly to the future, it now employs around 50 people and has expanded its product range to more than 100 different ice creams, creams, cheeses and yoghurts, and is establishing itself as a national dairy business. The relationship started as a collaboration with the team at the University’s Electron Microscopy Centre (PEMC). The dairy had noticed small differences in the consistency of its soft cheese and asked PEMC to help it examine the products more closely. By generating high resolution images of the cheese using PEMC’s scanning electron microscopes, the micro-structures across a range of batches of cheese could be examined. It was a good result for the business, who could put the knowledge gained directly into practice. They acknowledged that access to such specialist equipment and expert knowledge was a huge boon to their growth plans, and not something they had thought possible from this rural corner of the South West. The success sparked further conversations, and paved the way for a project with Plymouth Business School students, who are advising Langage Farm on its marketing plans. Personal connections developed; staff grew to know one another; and a longer-term project in the shape of a Knowledge Transfer Partnership (KTP) was forged. KTP Associate Anna Tatkiewicz is now working with the business to understand the science behind small seasonal variations in the dairy products’ appearance and texture. 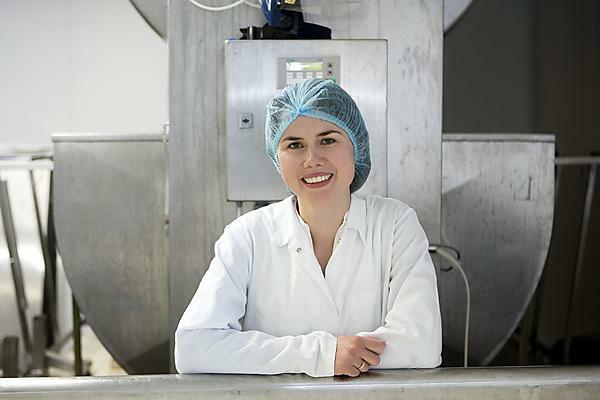 Supported by University of Plymouth Lecturer in Food Quality Dr Victor Kuri, Anna is advising the firm how to alter its processes to deliver more consistent products–something that is particularly important to supermarkets. Now, just a year into its KTP with the University of Plymouth, Langage Farm has signed a £4.2 million contract to supply yoghurts to one of the UK’s largest supermarkets. This is the firm’s biggest deal ever and will create ten new jobs. This case study is featured in the National Centre for Universities and Business State of the Relationship report 2017, which provides “fantastic examples of university business partnerships”.